When you have 2 or more kids it’s that much harder to juggle everything you need to do and take care of the kids properly. When you go outdoors, assuring your kids comfort and safety is a must. The best way to offer the kids the perfect conditions and make everything more manageable and easy for you is buying a double stroller. There are different types of double strollers, but the main categories are: lightweight, tandem and double jogging. In this guide we’re going to take a closer look at tandem strollers, to see which are the deciding factors in choosing the best tandem stroller. Double strollers have evolved a lot since they first appeared, to more efficiently cover the needs of parents that have 2 or more kids. Some of the top models that you can find today are very user friendly and are oriented towards the needs of modern families’ lives. 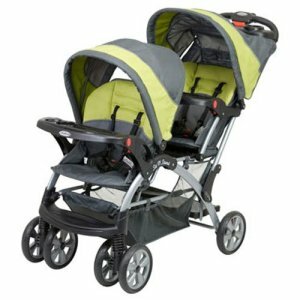 Tandem strollers, generally are more compact when compared to side-by-side strollers. But besides the obvious, there are other benefits that tandem strollers offer their users. 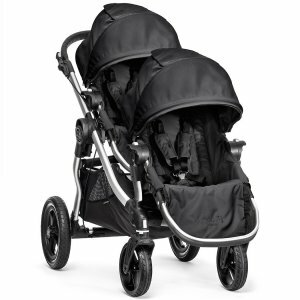 The best tandem strollers on the market are some of the most versatile products of their kind. 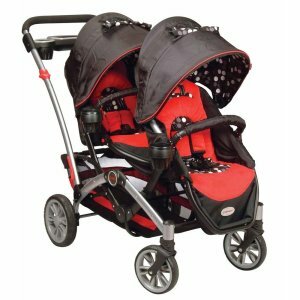 Although there are some side-by-side strollers that offer some degree of flexibility, generally speaking, tandem strollers offer the most flexibility of them all. You know how children can get bored pretty quickly and once they lose their composure, it can ruin the day. Some tandem strollers offer the the kids the ability to choose how they want to sit, due to highly adjustable seats. This great and innovative feature makes this type of stroller very fun for the kids, and consequently very convenient and stress free for the parents. The ability to choose between different positions of the seat facing different sides while outdoors keeps the kids occupied ans increases the amount of time before they want to get out. 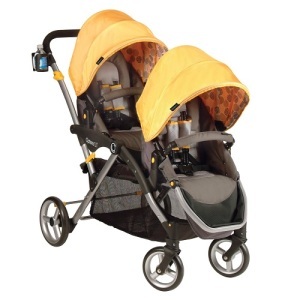 Tandem strollers are generally very narrow because both seats are positioned on the same line. This is a nice advantage when you go through doors, narrow pathways or aisles in a store. The reduced dimensions make them very convenient to maneuver. Most of them also fold up very easily, and you scan store them in closets because they will not take up a lot of space. Most models have a storage basket underneath the seats that is big enough to store everything your kids need plus some of your things. Some models also have side pockets where you can put some of the things you need easy access to. Another nice feature that you can find on certain models are related to convenience and safety. Some feature secure foot brakes that block the back wheels. The handlebars on some models are adjustable, which is a big advantage for taller people. Another convenient feature that some models have are cup holders and/or trays for both kids and parents. It features seats that you can position in 6 different ways, offering the flexibility most parents and kids need. It weighs 37 lbs. It’s not the lightest stroller, but on the other side the weight difference is represented by features that keep your kids comfortable and safe. The individual canopies of the seats are capable of being adjusted to protect the babies from the sun, rain and other surrounding elements that could harm them. It’s very convenient and use-friendly having a cup-holder for for every member of the family (2 for parents, 2 for kids). It’s easy to use it as a complete travel system because can attach an infant car seat. It’s relatively compact, folding easily to a size that lets you store it in narrower spaces pretty easily. It’s one of the most flexible tandem strollers around. You can choose from 16 different seating positions, which makes it very popular, especially among parents that have 2 overly energetic kids. It uses a patented folding technology called Quick Fold that lets you fold the stroller in one move to a very flat size. This makes it easy to store even for families that live in apartments. For increased comfort of the little passengers, the seats recline in multiple positions. The wheels are designed to offer the most comfortable ride. They all have ball bearings, the front wheels have suspensions. The back wheels are pretty sturdy and will not need to be inflated. It can support your kids up until they reach 45 pounds each. Smaller kids will benefit from an optimal foot support because you can adjust it to a perfect fit. It’s made of metal, plastic and polyester. You can fold it by using only one hand. This means you have a hand free to hold your kid in the meantime. The seats are capable of holding your kids until they reach 40 pounds each. They also recline to offer a comfortable napping posture. The footrests are a nice addition that enhance the overall comfort level. It features one of the biggest storage baskets beneath the seats, that you can access from behind the stroller. It will hold most of the babies’ things and most of your own. You’ll be able to easily store even bigger items like diaper packages. 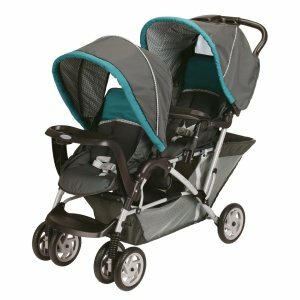 One of the deciding factors that makes this probably the best value for money choice in tandem strollers is the price it sells for, at under $150 on retail sites like Amazon, the Graco DuoGlider Classic Connect represents a financially-wise choice, given the value you get for this price. The seats are very comfortable and safe. They are positioned in a stadium-style, to offer your kids a good view of the environment around them. The also recline independently to offer each child the position needed at all times. Both seats include footrests and 5-point harnesses for maximum safety. Your kids can use this stroller until they reach 40 pounds. The wheels have are sturdy and offer a smooth ride to to the suspension system on the front wheels. They are also designed to never go flat, which makes it a recommended option for parents who would go over uneven areas during their stroll. It’s also recommended for parents who like to travel a lot as it has only 33 pounds, with both seats installed and the easy folding and compact design makes it a breeze to put in car trunks, or take with you if you travel by plane. As much as storage space is concerned, it has plenty. The big basket underneath the seats can hold everything that your kids and you need to take with while going outdoors. The younger child can ride in the front, while the older child can either sit or stand in the back. Babies don’t create too many difficulties while going out, but once your kid reaches a certain age, he will probably get bored pretty fast, so it’s a great thing for him to have he ability to stand if he gets tired of staying in the same position. One of the best things about the Sit N Stand is that besides trays for both passengers, it also has a tray for parents, with cup holder and a place to put your keys and phone. You can fit two infant car seats if you want instead of the seats of the stroller, making for a good travel solution. You can use it for your kids until any of them reaches a weight of 40 pounds or a height of 40 inches.